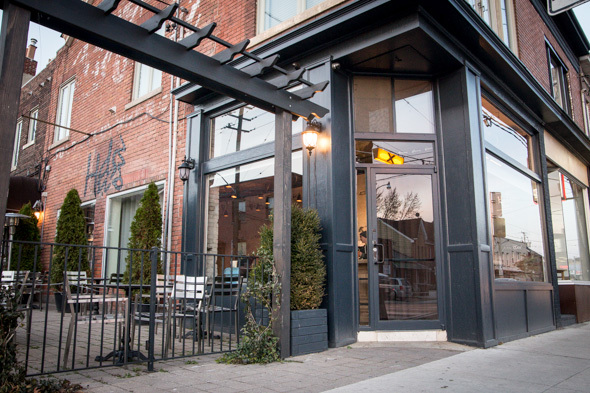 Hudson Kitchen is a month-old eatery on Dundas West in a newly combined space that formerly housed the Palmerston Cafe, Jamie Kennedy's Provenance and the One 800 Gallery. 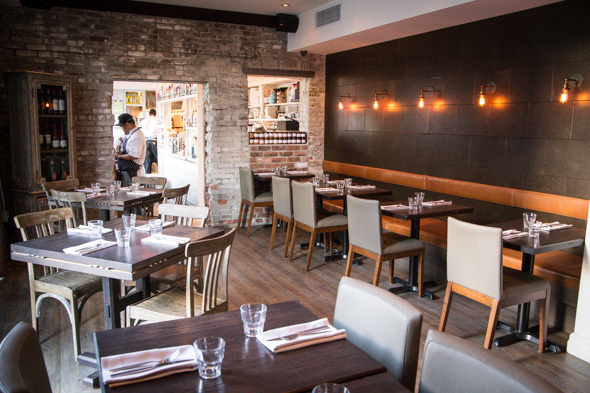 The 70-seat restaurant spreads across two rooms, plus there's a 10 seat space in the basement for private dining. In the summer, capacity is almost doubled by the patio and right in the middle of the action of the kitchen there's an additional eight seats at the chef's table. The interior by The Design Agency is warm and inviting. Original tin ceilings are painted black, while elsewhere one finds distressed layers of paint discovered whilst stripping the walls as part of renovation efforts. In the kitchen, Chef Robbie Hojilla (formerly of Ursa and Woodlot ) has put together the menu from an unusual point of departure. Seasonal, locally sourced vegetables are the focus here, while proteins are selected to complement the produce. 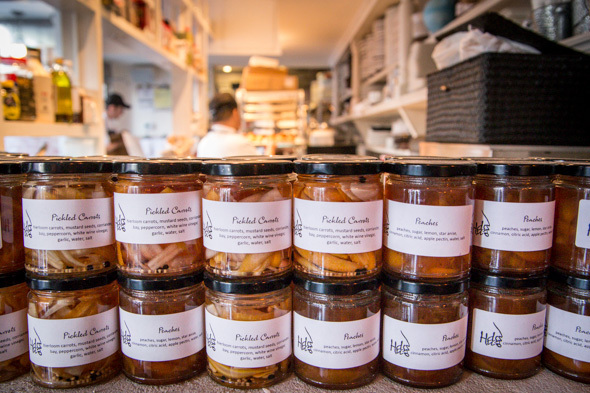 Hojilla employs a root-to-leaf philosophy, which, like nose to tail eating, means incorporating produce in its entirety, often presenting the same vegetable in two to three preparations per dish. The menu of contemporary North American cuisine is ever-changing but known to showcase about a half dozen apps and mains nightly. 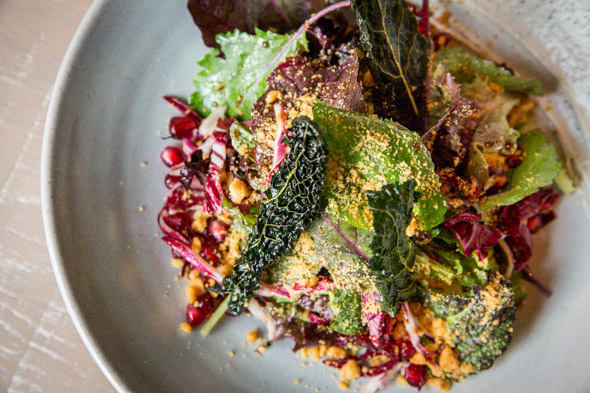 Expect to see examples of impressive vegetable cookery like the composed Harvest Salad ($14), an artful mix of greens and pomegranate seeds dressed with champagne vinaigrette and a golden dusting of walnut brittle. A smear of whipped blue cheese on the side adds complementary richness and salt. Vegetarians and vegans will find at least a few solid options. 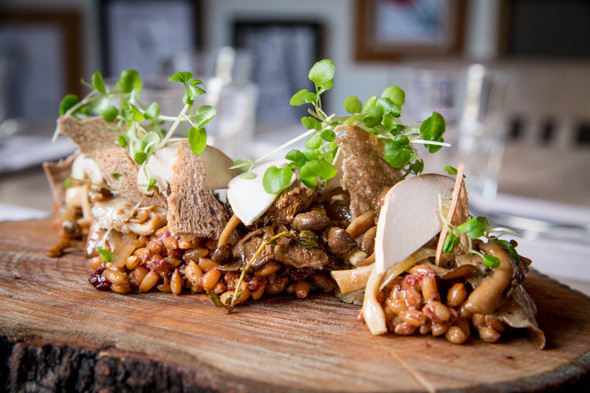 Tonight, a Wild Mushroom Salad ($14) is presented on a rustic wood board featuring a melange of foraged delicacies laid over hearty rye berries with micro watercress. The list of mains highlights thoughtful combinations. Tonight, selections include a Seared Pork Loin ($27) served with cider glazed belly, onions and parsnips, as well as a BC Steelhead Trout ($27) served with cauliflower, raisins and amaranth. From the bar a revolving list of cocktails from Jay Meyers is also in tune with the seasons. 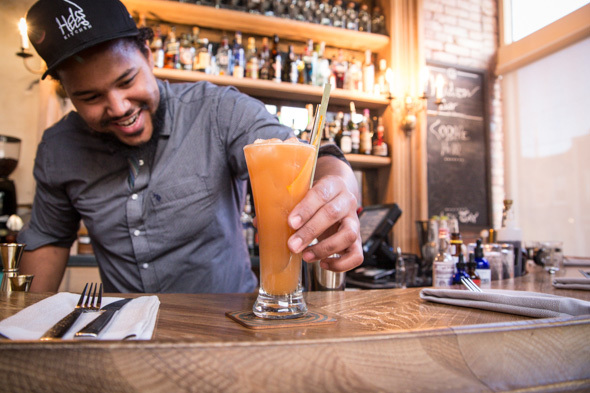 In time for the cooler weather there are drinks like The New Black ($13), a shandy-like libation made with Sailor Jerry's Spiced Rum, Seabuckthorn Liqueur, Dead Elephant IPA, Aperol, spiced syrup and lemon. The wine list offers about 30 bottles starting at about $40 or served by the glass starting at about $8. Hudson Kitchen is open nightly (except Mondays) at 6pm. Brunch is served weekends from 10am to 3pm. Reservations are recommended and are currently booking two to three weeks out, though seats at the bar are offered on a first come, first served basis.